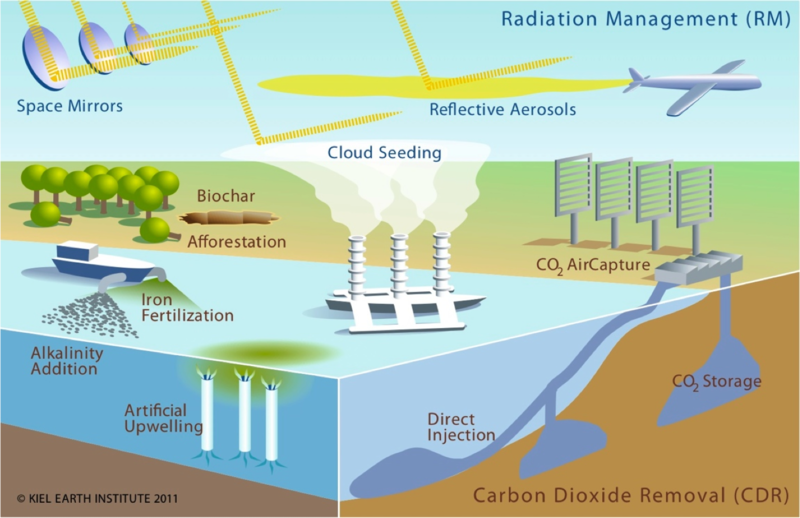 Climate engineering (CE) refers to large-scale technical interventions into the earth system that seek to offset the effects of anthropogenic GHG emissions. CE includes methods which shield the earth from incoming solar radiation (solar radiation management) and methods which take carbon out of the atmosphere (carbon dioxide removal). In 2010, the German Ministry of Education and Research (BMBF) commissioned six individual scoping studies on different aspects of CE. Eventually, these individual studies were to be integrated into a single, interdisciplinary assessment. Sebastian Cacean and myself have been charged with compiling a report on ethical aspects. and, finally, we revised our interpretation and reconstructed the arguments in detail (with Argunet). to merge the various disciplinary studies in a final assessment report (download). Ad 1. 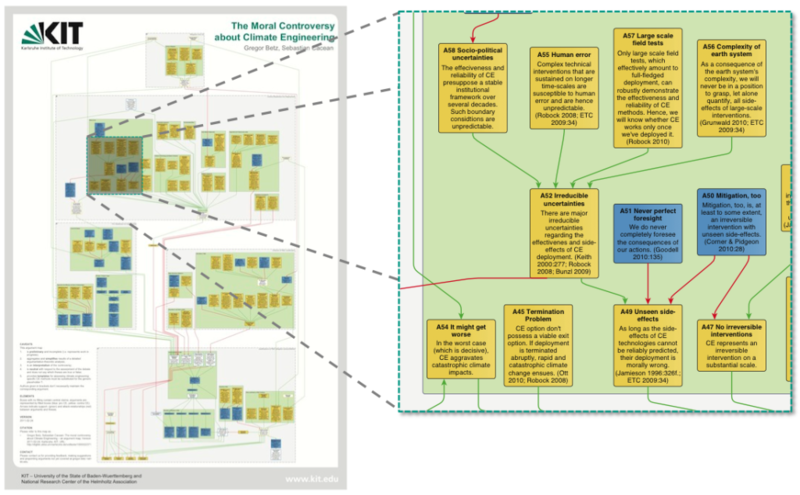 ): The scoping study on ethical aspects of climate engineering contains a macro map of the debate that structures the entire report. Each chapter is devoted to a sub-debate of the controversy. The chapters in turn feature micro maps that display the internal structure of the sub-debates and visualize the individual arguments plus their dialectic relations. The arguments are then discussed in detail in the chapter texts. Central arguments are reconstructed as premiss-conclusion structures. Ad 2.) We’ve also used the argument map to assist stakeholders in acquiring a coherent position. Thus, we’ve identified alternative core positions the ministry, or another stakeholder, may adopt. Such a core position might, e.g., consist in saying that CE should be researched into so as to have these methods ready for deployment in time. We’ve than visualized the core position in the argument map and calculated the logico-argumentative implications of the corresponding stance. The map shows, accordingly, which arguments one is required to refute and which theses one is compelled to accept if one adopts the corresponding core position. By spelling out such implications we tried to enable stakeholders to take all arguments into account and to develop a well-considered position. Ad 3.) 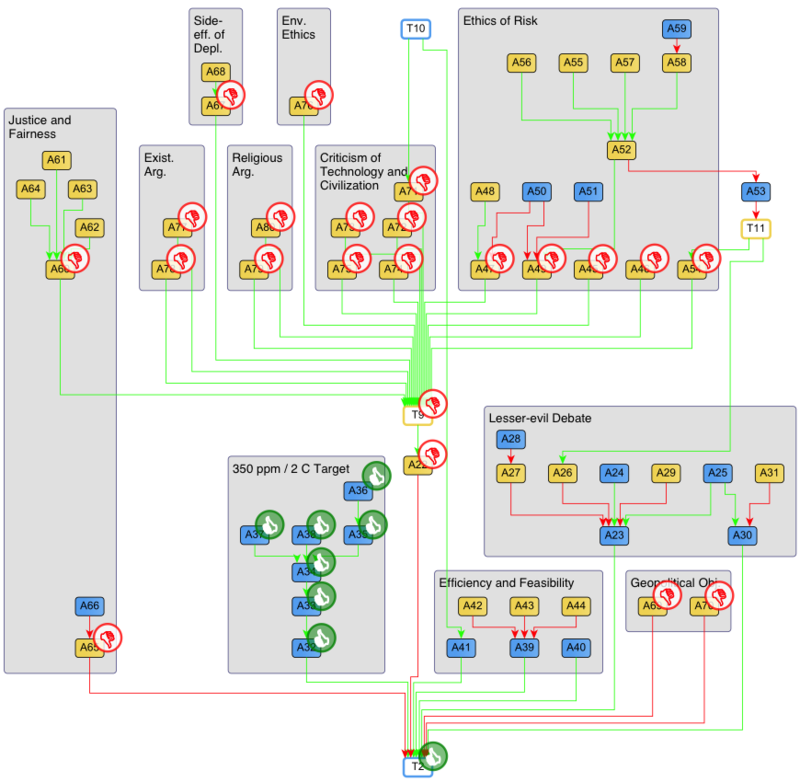 The argument map proved also helpful in integrating the various discipline-specific studies into a single, interdisciplinary assessment report. So, the assessment report, too, starts with a macro map, which depicts the overall structure of the discourse, and lists the pivotal arguments. Most interestingly, though, all the empirical chapters of the assessment report (on physical and technical aspects, on sociological aspects, on governance aspects, etc.) consistently refer to the argument map and make explicit to which arguments the empirical discussion unfolded in the chapter is related. This allows one to trace back sophisticated empirical considerations to the general debate and hence to the key questions of the controversy. In sum, we found that argument mapping techniques are very helpful in compiling assessment reports. Accordingly employed, the impact of argument mapping on societal discourse and policy deliberation clearly depends on whether the reports are actually read. So, one requirement that has been highlighted by this project is to develop ways for engaging recipients more actively with an argument analysis, e.g. through talks, videos or an interactive website. Other posts summarize our experience with such active involvement.